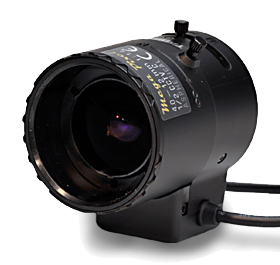 The M12VG412 is especially designed for 1/2“ Megapixel cameras. It shares the same housing like the 12VG412ASIR, but it’s internal lens design is a total new development. As with our 1/3” Megapixel lenses, hybrid- aspherical lens elements are used to ensure the Megapixel resolution even at F/1.4. In combination with the patented Tamron coating this lens can cope with the most extreme light conditions. If you are using it outside or inside, at brightest daylight or at raining nights, with the M12VG412 your Megapixel camera will always have Megapixel resolution. Only our Megapixel fixed focal length lenses (2/3” and 1/1.8”), developed for Machine Vision applications can resolve even more Pixels. Available with manual and DC iris.